Card Text Play: If your opponent forged a key on their previous turn, unforge it. Your opponent gains 6 . Flavor text What time is it? If my opponent did not forge a key on their previous turn, can I still play Key Hammer to gain the Æmber bonus? Yes. The first step in playing any card is to receive the Æmber bonus, if any. Therefore, you can always play action cards to get the Æmber bonus, but are still obligated to resolve as much of the action card as possible (e.g. “Your opponent gains 6 Æmber”). If the action card’s “Play:” ability is not resolvable – in part or as a whole – you still keep the Æmber bonus. Warning: due to how Key Hammer is worded, your opponent will always gain 6 Æmber when you play it, even if you don’t unforge one of their keys. 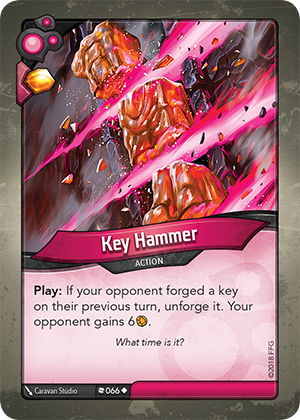 Therefore, if your opponent did not forge a key on their previous turn, playing Key Hammer would give them 6 Æmber for free.